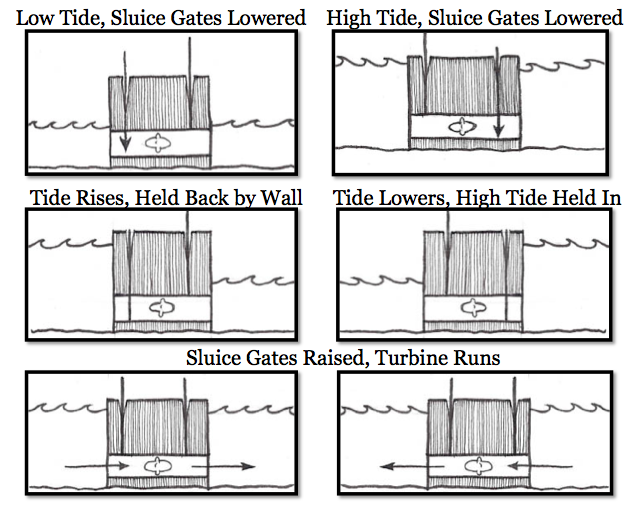 Tidal range energy depends on the incoming and outgoing tides to generate electricity. In a manner similar to a traditional hydroelectric project, these systems use the force of gravity acting on a large reservoir of water to drive a turbine. At low tide, the sluice gates are closed and the low tide water level is held in the reservoir behind the retaining wall. 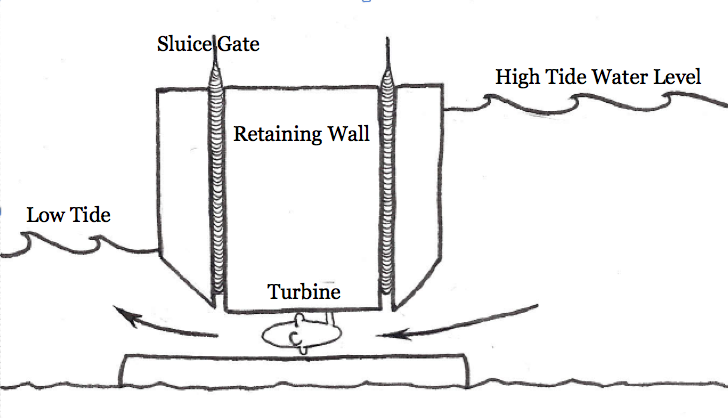 The tide rises on the other side of the wall, and at peak high tide the sluice gates are reopened and the high tide rushes in, running the turbine. The sluice gates are then closed again and tide goes out, leaving the high tide water level in the reservoir behind the wall. At the lowest point of low tide, the gates are opened, letting the high water level behind the wall rush back into the basin and the turbine runs again. Hi I like your concepts for sea power I am involved in the renewable energy program here at TMCC in Reno, Nv. I would like to build great things and stay involved. Please let me know if you know of any programs up here.